This is… well, how can I put it? This is a strange one. Not “bad” strange, not “completely inappropriate” strange, not “What the hell were they thinking?” strange, but just sort of unusual. More than that however this record is a peak into the still evolving outlook by musicians and record labels as to the viability of this two year old music called rock ‘n’ roll as they made a futile effort to peer into the future and see just how enduring it would wind up being. Sometimes that view was understandably a bit hazy. Usually by the time we’ve covered as many releases of an artist as we have thus far with Joe Morris (this being the seventh single in a year and a half) we should have a pretty good sense of who they are and what type of artist they’re shaping up to be. What’s their style in other words, their specific niche in the rock ‘n’ roll world. On the surface Joe Morris seems to have settled in to a fairly stable slot as the most consistent artist on the Atlantic roster, the leader of a very strong, well disciplined band specializing in instrumentals, yet capable of mixing things up with a few vocals, all of which rely on riffing horns and good interplay between the musicians. Their records haven’t been extraordinary, no big green numbers in the scorecard yet, but they’ve been remarkably consistent and have provided more than serviceable examples of rock at its most professional. That’s probably the most appropriate term to use with them. Though still fairly young they were veterans of Lionel Hampton’s acclaimed jazz band and had been drilled in proper technique before entering the rock world and came to the table armed with exacting standards in the studio. Don’t for a second think of those attributes as middling at best, or worse yet as unimportant. For an inexperienced label as Atlantic was they needed their artists to carry a larger load in terms of responsibility in the studio. The company wasn’t yet at the point where they could reasonably be expected to guide the sessions with a stern hand, working methodically to extract the best results out of eager but untested acts. They needed a band to be all business when they came in those doors, no fooling around, no taking forever to get into the flow of recording, no endless takes trying to get one song down. For Atlantic in the early days Joe Morris was a godsend. A versatile band with rigorous standards. But what KIND of band were they? That was always the underlying question with them. Jazz born and bred, they signed with Atlantic to step out of the shadow of the bigger names they’d been playing behind and were surely expected to help make the label an up and coming player in the jazz scene. But that scene was rapidly dimming in terms of commercial potency while another, far more uncouth brand of music was emerging. We all know what happened, Morris and crew cut records for both markets and the ones which had the best commercial returns were the rock sides. Along with fellow jazz refugee Tiny Grimes they were Atlantic’s only hits, only moneymakers and even their only artistically significant releases in the first year and a half in business. Thus out of practical necessity as much as anything else Joe Morris and Atlantic became part of the rock movement. Okay, okay, we know all that. Thanks for the recap, you must be saying, but when are we going to get to THIS record?. Hold your horses, we’re getting there. The point of that recap wasn’t just to fill a quarter of the allotted space for a normal review, but rather to reiterate how unplanned and accidental their shift to rock had been. This was no conscious decision, at least not at the start, they merely threw a whole bunch of different type sides into the marketplace and it was the audience who decided what they liked and what they didn’t and they liked the rockers. But does that mean that Morris and company liked the same thing? Would it mean that they’d forsake all of their earlier musical interests and commit wholeheartedly to something that hadn’t even existed when they earned their first paychecks with Hampton? If so, it wouldn’t be without some reservations. And so Morris kept cutting sides that veered closer to jazz, maybe they’d just wind up being a B-side but the thought was that one of those might catch on with the pubic and that in turn could send their career back on the trajectory they all had likely been anticipating before rock changed their plans. So what does that make Chuck-A-Boogie (I mean aside from one of the worst titles we’ve come across so far). Not quite jazz, but not as undeniably rock ‘n’ roll as most of their earlier releases were. Instead it sits uneasily in ANY of the major genres even as it has traits taken from each of them. If you came into this cold and didn’t know the surrounding circumstances there’d be two ways to look at this from a big picture standpoint. The view from the Morris camp might be that this was something they’d earned by being one of the only consistent sellers on the Atlantic label, a chance to branch out slightly in their approach, hoping to either expand the parameters of rock allowing for a different mindset to start to take hold, or to give them some entry way back into the outskirts of jazz without fully compromising their rock credentials in the process. But from Atlantic’s perspective they were now playing for higher commercial stakes than back when Lowe Groovin’ had been all that stood between them and going out of business. They’d scored two huge hits in the past few months with two recently signed artists, Stick McGhee who hit #2 with Drinkin’ Wine Spo-Dee-O-Dee and Ruth Brown who went to #4 with So Long. Though they’d recently lost their other star Tiny Grimes to Gotham Records, they were in a stronger position than they’d ever been. So if Morris wanted to move a little further away from what sold that was fine, because if it didn’t work they finally had others who could be reasonably expected to take his place in the pecking order. But neither one of those is quite the case. 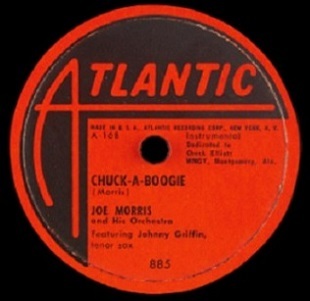 Chuck-A-Boogie had actually been recorded in late December 1948 and that session wasn’t very different from any of the ones which preceded it. They cut songs that spanned the stylistic spectrum and left it to Atlantic to decide what to issue when and what to pair them each with. In other words it was business as usual for them all, artists and label alike. But what changed though was the fact that Morris would have just one more session (and only a half-session at that, meaning two songs cut instead of the usual four) in May of ’49 before leaving the label around the same time as Grimes did. Had Morris stuck around it’s likely this would’ve been merely a B-side to a more appropriate entry in the rock realm that he’d churn out at a later date, or perhaps it might even go unreleased altogether. But once he left Atlantic wasn’t going to waste songs they’d already paid for him to cut, especially when he was popular enough to pull in sales consistently and so they did what they could with the leftovers, pairing this with the even more indescribable Boogie Woogie March from that same session. Both songs were oddball fits in any established genre, but not SO out of place that they’d leave you scratching your head. Chuck-A-Boogie works slightly better for our purposes in rock but it’s more of a circumstantial inclusion here than one made with any real intent on their part to fit in with the program. So maybe this will be better received here with diminished expectations… not that audiences in 1949 would’ve known any of that which could be why it was passed over without a second thought. Still, with Joe Morris even the more vague stylistic efforts are bound to have something going for them, even if it’s just that aforementioned professionalism which was still a quality to be admired in a field that could sound at times as if the musicians had just met for the first time once they were in the studio… and had taken their first lessons on their instruments a week and a half before that. The slightly romping beat with piano and drums which lean heavily on the cymbals that opens Chuck-A-Boogie hardly disqualifies it from rock membership at any rate, but it also doesn’t proudly declare its qualifications to be included either. It prances a little too much for that, they ride that cymbal – a distinctly jazz trait – too hard when they should’ve been putting more emphasize on the bass or cracking the snare to give it a jolt, but it’s hardly off-putting. When the horns come in they’re flying in tight formation, another attribute that has been falling out of favor in rock for quite some time now, as the massed horn sections of jazz have been forcibly broken up by rock bands which finally understood the need to distance themselves from that image while injecting much need power to what they play in order to satisfy the demands of this audience. The key was of course springing the tenor sax from the larger horn section and giving him free reign to improvise as passionately and wildly as could be tolerated. 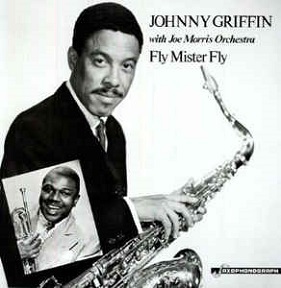 In Johnny Griffin they have someone eminently capable of doing just that, but if anyone in the group was starting to blanch at the idea of making so much noise on record by playing as out of control as possible it was the jazz devotee Griffin. So here he doesn’t step out front and take over much. For much of this he stays alongside the others, playing surging riffs that sound okay but not exactly appropriate if you lay it alongside the best rock instrumentals of the day. When Griffin finally does get coaxed into the spotlight he’s the best aspect of this, or at least the most overtly rock due to his instrument as much as his playing, but he’s not asserting himself nearly enough to elevate this. Oh he honks some, but never too crudely. He rises up in tone at times, but never resorts to squealing like a stuck pig. He utilizes some lung power but never has you startled that he didn’t run out of breath because he was playing so frantically. Truthfully it’s rather generic… well played, but mostly it’s just sort of there, filling space, doing what’s asked of him but no more than that. The other horns, including Morris on trumpet, are a bit more spry but their group higher toned squawks are from another age, maybe just two or three years earlier, and again not quite cutting edge jazz from that time either, but nothing special even if they do raise the energy level a lot. This is why we called this “strange” at the beginning, it’s not a strange sound overall, but strange in that it seems to have no home in any one style and of course that’s what ultimately sinks it. If they’d gone jazzy on us that’d be easy to classify and therefore politely dismiss. It’d simply be a case of former jazz musicians returning to something they loved – commercially misguided maybe, certainly not something we’d even be likely to cover here other than to point out their shift away from us in the rock universe, but at least it’d be easy to discern their intent. But this doesn’t go nearly far enough into that world to convince you that’s what they were doing. Yet at the same time it also doesn’t give us enough of the rock attributes we need to make you think they had a workable song that merely got plagued by a few missteps in its execution. Instead Chuck-A-Boogie seems to let both styles mingle together with no sensible game plan to tie them in with one another. Though it doesn’t clash it also doesn’t distinguish itself in either format. They were good enough musicians where they could make something as innocuous and directionless as this sound respectable, and it does do that much at least, but it also shows that in music skill itself is never enough to compensate for lacking a strong vision in everything you play. In the end it’s probably just a shade better than the score I’ve settled upon, especially if listened to in isolation, but around here we don’t listen in isolation. We’re interested in how each record fits in aesthetically with the rest of the rock releases in the fall of 1949… does it break new ground, conform to the general standards of the times or does it sound hopelessly out of date? I don’t what the answer is for that question, but it’s definitely not ahead of its time and doesn’t make for an easy fit with the average releases for the era either. Perhaps you can’t rightly call it completely out of date but it IS out of step and oftentimes that’s a more damning criticism than any other we could offer. Leave a reply on "Joe Morris: “Chuck-A-Boogie”"